Finder, the standard file manager for Mac, is quite handy. The only problem is that you have to open two windows to work with multiple sources. All sorts of tools with the ability to “cling” windows to the edges of the screen work well with Finder. However, advanced users often need something more customary, like additional functions and mouse-free navigation support. 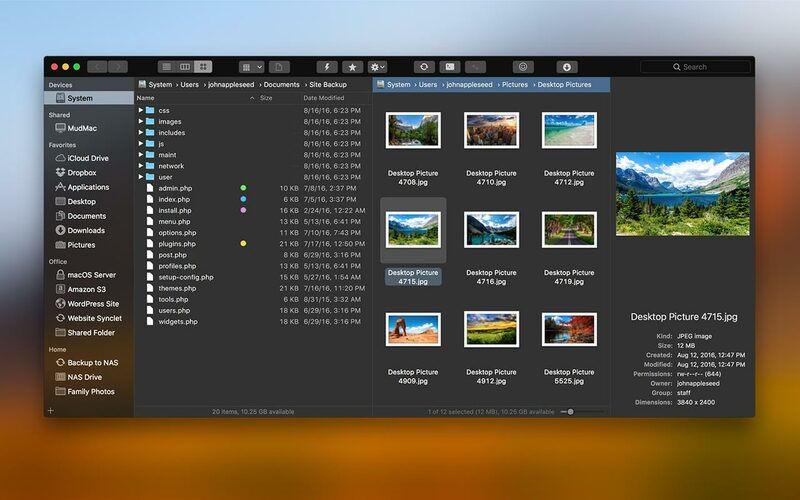 Here are some excellent file managers that can serve as an alternative to Finder. At first glance, the app is no different from Finder, which is an undoubted advantage that makes it easier for users to get used to the new interface. You can also customize the app to your liking if needed. The two main advantages of Path Finder are two panels and support for multiple tabs. The user also has the ability to create their own sets of tabs and switch between them. The app also makes working with archives and disk images much more convenient. Path Finder has everything you might need when archiving or unpacking files. No need to use any third-party software, as everything is already provided here. You can customize various pull-out sections of Path Finder to display the information you need. You can also modify these sections by adding the items you need to view, for example, Cover Flow, iTunes Browser, Processes, File Attributes, Recent files/folders, and so on. You can also quickly start the program by typing the first few letters. Unlike its nearest competitor, Path Finder, which feels quite heavy, ForkLift is much “lighter,” with a quick start and fast commands execution. The app looks very similar to the original file manager for Mac, except for additional panel with a list of files and a lot of buttons on the toolbar. In addition to the two panels, the app offers tabs that can be dragged (between panels also) and saved while leaving ForkLift. In addition to convenient navigation, setapp.com/apps/forklift offers a lot of rich features for accessing various remote file systems. Navigating through remote file systems is no different from navigating your own drive. Like any decent FTP client, ForkLift allows for file editing directly on the server, downloading files locally to a temporary folder and sending them to the server. With the same simplicity, ForkLift allows you to copy URLs of deleted files, for example, for sending by mail. Besides, if the server supports FXP, then you can copy files from one server to another without the local machine. TotalFinder is not an alternative file manager but an add-on for the Finder, developed by the guys from BinaryAge. What attracts in TotalFinder is multiple tabs (data can be copied simply by dragging it onto the title of the corresponding tab), Visor mode (in which the window appears at the bottom of the screen). The app also allows for instant switching to a two-panel mode. There are a lot of settings, so you can easily find the functions you need. There are no obvious minuses in TotalFinder’s work. It works quickly and steadily. The only thing that can make you uncomfortable is Google Chrome-like tabs, but this inconvenience is rather aesthetic and doesn’t affect the general impression of the app. Raskin responds almost instantly and shows excellent performance, despite the abundance of animation effects in the interface. By the way, the interface itself doesn’t resemble that of Mac OS X. It’s something completely different from what the Mac users are used to. When you launch Raskin for the first time, it analyzes the contents of your hard drive. Its tabs are a bit small, but Raskin was designed to work with multitouch, so tapping the screen, you can quickly scale them and move between them. For example, just click on any panel to make it larger and manage your content comfortably. Raskin also allows for moving files between panels by dragging them from one to another, launching applications, and, in general, it does everything the file manager does. It also should be noted that this file manager for Mac has a global shortcut which allows you to start it from any application if needed. All file managers for Mac don’t actually offer that much functionality and generally seem like unfinished products. Any user, who just switched from Windows to Mac, can notice that. Perhaps the lack of high-quality products can be explained by the fact that many OS X users don’t need it.